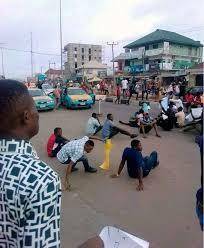 The students of Adekunle Ajasin University Akungba Akoko (AAUA), Ondo state yesterday, 9th April, took over the streets of Oba Adesida road to Alagbaka in Akure, the Ondo State capital, to protest hike in their tuition which was led by Adewumi Adebowale, NANS Chairman, Ondo State branch. The management of AAUA last week had released the tuition fees for 2017/1018 academic session with an outrageous increase in the school fees for both old and new students. The fee was increased from N30,000 to N180,000. This did not go down well with the students, so they decided to embark on a peaceful protest to say no to the hike in their school fees.They prevented free flow of traffic, blocked the major roads and shops owners were affected as well. It was gathered that they were later driven by some anti-riot policemen who released teargas. Meanwhile rumors have it that, some student got injured, however this has not been confirmed.